Posted 1/23/2013 I've been lucky in my time living in California. 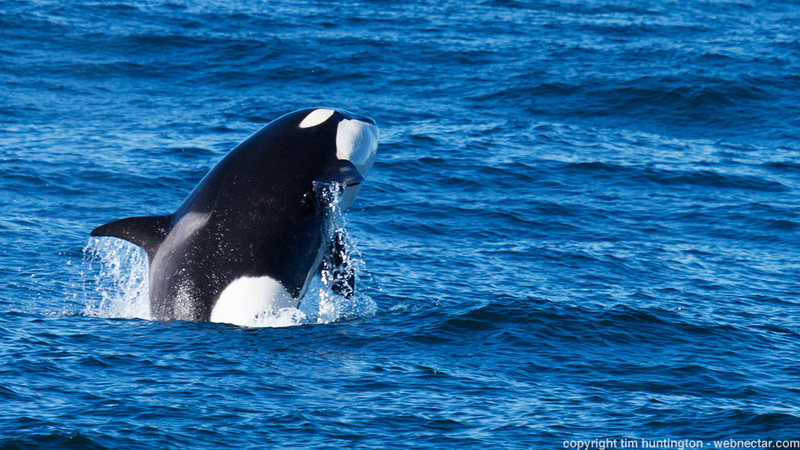 I've gotten to see lots of different species of wildlife over the years, however there was one species that I had not yet seen up close in the wild, orcas! I've seen them three times from the shore, always at quite a distance and although cool, I've wanted to see them up close from a boat. 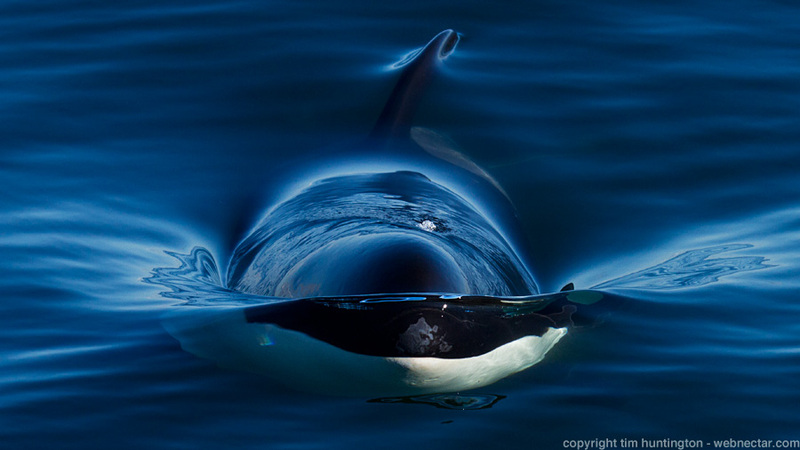 The Blue Ocean Whale Watch folks have have endured my presence a few times over the last couple of years and I've gotten to know the co-owners Jim and Kate, so when Kate starts tracking a pod of orcas coming down the coast from the Pacific north west, she keeps me in the loop. They're getting close enough to Monterey Bay that I decide to take a chance and head out on a cruise in the hope that the orcas turn up. As it turns out, those traveling orcas from the north never made it this far south, but once onboard the cruise after a while spent following greys around the bay, another pod of orcas are spotted and we head off in their direction. This pod turns out to be a local pod, but they're active. When we arrive on the scene, the waves are choppy, but the orcas are breaching, tail slapping and generally putting on a show. I quickly learn that the pitch of the boat, the orcas' unpredictability and most significantly, my lack of experience shooting orcas means that I get fairly good at shooting the splash after an orca breach. I have lots of splash photos, but no photos of the whales themselves. After an amazing close pass by the two males in the pod (very humbling to see these massive creatures pass within a few yards of you - I took the chance to put the camera down and view the unfolding events in "real time" for a little while), we end up following the female and two juveniles. One by one, the other whale watching boats in the area head back to port as they have to drop off their morning passengers and pick up their afternoon passengers, while we get to hang with the orcas as I'm with the one trip a day folks who are happy to extend the tour for something cool like this. As we follow along, two more really cool things happen. Firstly, we end up in super calm seas - the ocean is so photogenic it looks like a painting - add in orcas and you can't go wrong. Secondly, Kate spots a potential sea lion hunt on the surface, so we hang around for a few minutes to see if it kicks off, and it surely does - amazing to see these ocean predators do what they need to do. While all this is going on, the boat follows the rules regarding not harassing the orcas. We follow at a safe distance and when they dive for a few minutes, we idle, hoping they pop up again near us. The photo at the start of this entry shows an orca heading directly towards me. On this occasion, the orca popped up heading directly towards our idling boat and then dived under the boat. It was a totally amazing experience following these orcas for over an hour, you couldn't wipe the smile off my face for days and I continue to smile when I think back on it. A truly amazing and humbling day out on the Monterey Bay.